ASUSTOR's online technical support center integrates new knowledge base content and ASUSTOR ID accounts. Users can submit their questions online and view other frequently asked questions, receiving quick and timely technical support. Taipei, Taiwan, October 22nd 2013 – ASUSTOR Inc., a leading innovator and provider of network storage solutions, announced today that it has upgraded its online technical support system, providing ASUSTOR NAS users with faster and more convenient technical support services. ASUSTOR's technical support center now features a comprehensive technical knowledge base which automatically provides users with related content while they are submitting their questions. This allows users to quickly find the specific technical information that they need to troubleshoot any problems they may be having with their product in addition to the support provided by ASUSTOR's engineers. The ASUSTOR online technical support center features a multilingual interface and conveniently integrates all ASUSTOR ID accounts. 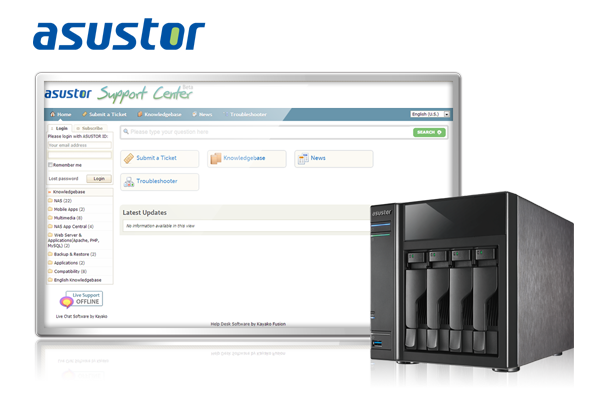 ASUSTOR NAS users do not have to create new accounts and can simply log in using their existing ASUSTOR ID accounts to obtain comprehensive technical support. Furthermore, users can also access ASUSTOR's official community forum to join in on technical discussions and receive additional information regarding their NAS.